Captain Cory Holland is a USCG licensed charter boat captain with many years experience on the water. Capt Cory is a military veteran and has fished all over from Alaska, to Mexico’s Sea of Cortez, and of course here in the Gulf of Mexico. He will guarantee a fun, safe, and memorable experience! You will be fishing on a 26 ft Sailfish boat. It is powered by twin 250 Yamaha 4 stroke outboards. This boat was meant for fishing! We can get to the fish fast which means more fishing time. We have state of the art electronics, a Furuno bottom machine, chart plotter, and radar. We also have plenty of storage and a huge console with a portable bathroom. I use state of the art fishing equipment to include Penn and Shimano reels. I have every tackle you can think of to target whatever fish we are after! You never know what you’re going to catch when fishing the Gulf of Mexico in Destin or Navarre FL! Depending on the time of year we will target king mackerel, spanish mackerel, red snapper, cobia, bonitos, amberjack, grouper, vermillion snapper, white snapper, blackfin tuna, etc. It is also not uncommon to catch a sailfish and sharks……bottom fishing and trolling is my specialty! 4 to 8 Hour Fishing Trips, Up to 6 Anglers! Come fish the beautiful Emerald Coast with us! I will guide the most experienced anglers, to family trips. Don’t forget to bring the kids! Making memories of a lifetime every day on the water! We provide licenses, bait, tackle, and ice. Things that you want to bring include towels, camera, hat, sunglasses, sunblock, snacks, drinks, a small cooler, and your favorite music playlist! I’ve never caught as many fish as I do with Captain Cory. He took my daughter and I out and he knows where to go! We limited out on snapper and had a blast! He is very personable, patient, and a great teacher. Whether you are a novice at fishing or a seasoned angler, this charter and Captain Cory are sure to please. We’ve been out fishing with other charters in the past, but the experience with Captain Cory exceeded all of our expectations! He put us on the fish and showed us a fantastic time! We will definitely be going out with him again!! 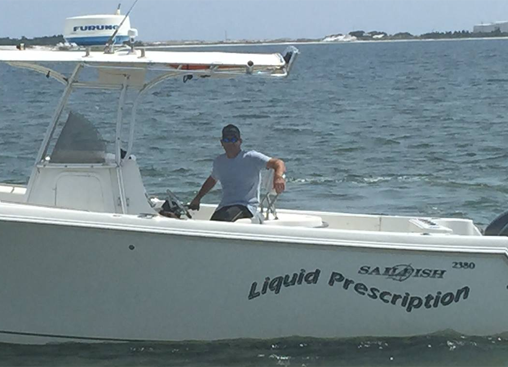 Prescription Charters with Capt Cory Holland.